St. John’s and its congregation has been gathering to worship since settlers first came to Bluffton, Ohio. This excerpt, a history of our church, was featured in the book, “Town at the Fork of the Rileys: Historical Sketches of Old Shannon and Bluffton”. The Reformed Church was first organized as a German Reformed and Lutheran society in 1842 by Rev. George Spengler. The congregation was made up almost wholly of Swiss settlers of the south and west of Bluffton. A brick church was built in 1860 under the leadership of Rev. Dr. P. Greding. It was located on the northwest corner of Section 22, near the center of the township, near what is commonly designated as the Gratz school corner. In 1861 the congregation was reorganized as the German Reformed Church and adopted the constitution of the German Reformed Church of the United States. In 1885 the church had a membership of 200. Early pastors were George Spengler, A. Doner, C. H. Pfaff, J. Klingler, J. Reiter, Dr. P. Greding, C. Pluess, A. Schneck, H. Rusterhole and G. Kuhlen. In 1872 a new church was formed at Bluffton and a number of members were dismissed from the congregation to organize the new society. This congregation used the Presbyterian church as a place of worship until 1881, when the new church building was completed. The same pastor was in charge of both congregations. In 1956 a new religious education addition (Oppermann Hall) was erected at the rear of the church. 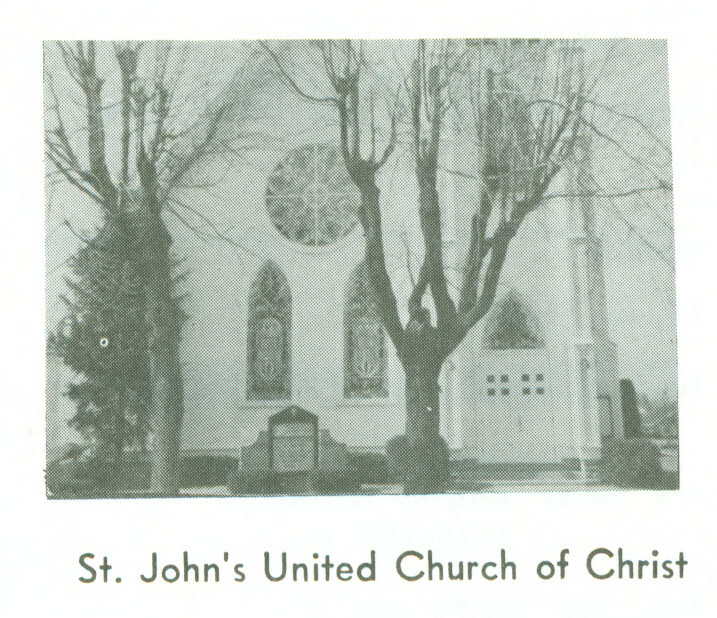 Two years ago (1959) the Evangelical & Reformed church was merged with the Congregational-Christian church nationally and the denomination is now known as the United Church of Christ, the country church being known as Emmanuel’s and the town church as St. John’s, with a membership of 409 (in 1961).